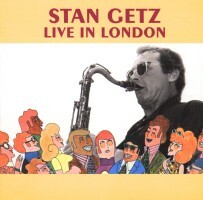 Stan Getz, tenor saxophone; Stan Tracey, piano; Malcolm Cecil, bass; Ronnie Stephenson, drums; Drums on tracks 6 & 7 Allan Ganley; Drums on tracks 8 & 9 Jackie Dougan. Recorded live at Ronnie Scott's Jazz Club, London in March and April 1964. March 1964 represented an historic double first for Stan Getzhis first appearance in a British jazz club; his first time working with a British rhythm section. For me, as an avid devotee of both Stans, Getz and Tracey, it was a joy to be able to capture some substantial samples of their singular and highly successful meeting. As Stan G. told me at the time: "I was a little wary of coming over and working with a strange rhythm section, but I was very happy with these guys. They're really goodthey have big ears". One of the advantages of recording in a jazz club is that the musicians involved do not have to know that they are being recorded. In this case they didn't, and the playing of Stan Getz on this selection clearly displays that. For Getz, the perennial cool customer, free of the limitations a recording session might possibly impose, plays on this session like a man possessed. Oh  to be sure he retains the magic we have all loved over the years, ever since that first, utterly delightful solo on his debut with Woody Herman in Early Autumn, and delivers glorious solos in the ballads  one finds oneself wishing that Here's That Rainy Day would never end. On Little Girl Blue he weaves an intricate web of a lullaby that is breathtaking in its compassion and a deeply soulful understanding of the lyric. It's when the tempo heats up that he gets going in a way I've never heard from him before. He hits All God's Children like a fierce hot desert storm  a nonstop display of technique and harmonic wizardry that goes on for five searing minutes until he stops to allow Stan Tracey to put his word in. An all too short piano solo, followed by another from Malcolm Cecil and Getz is back again, even more frantically than before. And yet, with all of the fire and explosion  yes  he plays harmonics on this session, too!  he still is, somehow, underneath, the cool cat we know. How is it possible to be fiery and cool at the same time? How does he do that? This recording is sheer delight from beginning to end. And here's the really good news  there are still more cuts from these sessions that may well be released in the future. Because you are in a jazz club one hears the occasional foot tapping of the countins to the numbers and one or two noises from the club patrons; applause, too. Now and again you hear Getz telling the guys what they are going to play next. All part of the atmosphere. I didn't notice these noises much. I was too busy getting thrilled by what was happening on stage. But these sounds are all a part of the delicious secret, anyway. We are eavesdropping on Getz playing at his stupendous best  and he doesn't even know it!